One of the very few vegetables my Mr 5 will eat (and I'm not counting chips as a vegetable because he won't touch homemade ones) is corn on the cob. But there is absolutely no way he will eat a muffin, pancake or anything else with pieces of corn in it. I adore corn fritters with their sweet and savoury flavour and packed with herbs. But I accept that those won't get eaten and sometimes you have to compromise. 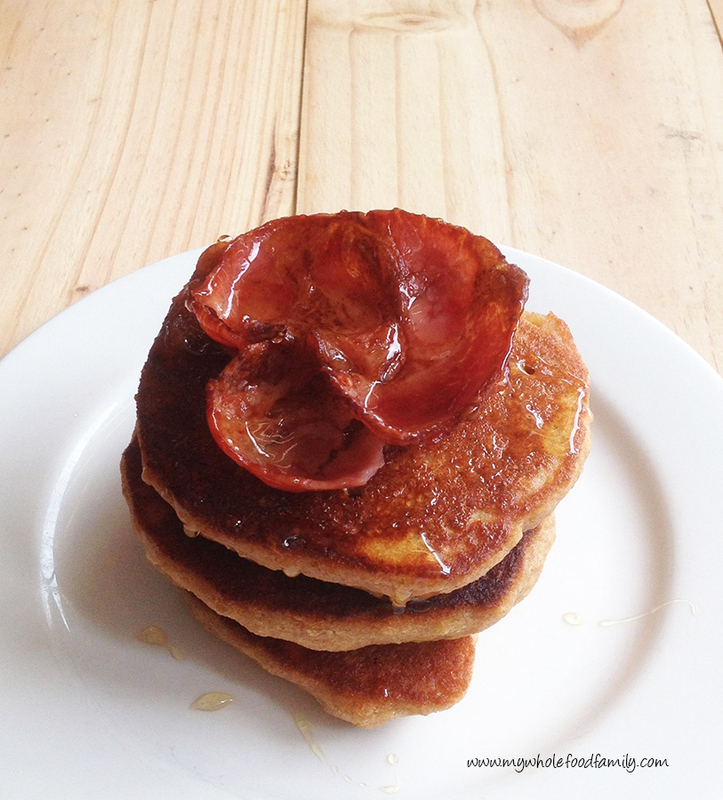 I came up with these sweet corn pancakes and was delighted to see them gobbled up without a pause. The secret is processing the corn with the eggs and milk to form a completely smooth puree. The small amount of coconut sugar enhances the sweetness but you could leave that out, add 1/2 ts salt and make them savoury instead. They would be delicious served with avocado and smoked salmon. Hope your fussy eaters enjoy these as much as mine! Place the corn kernels into the food processor and blitz until chopped. Add the eggs and milk and process for 30 seconds or so, scraping down the sides if you need to, until the mixture is completely smooth. Add the dry ingredients and process until just combined. Use a spatula to scrap the sides and mix through an extra flour. * Add an extra tbs or so of milk if you feel the batter is too thick at this stage as all flours differ. Heat a large frypan over medium heat and add the oil or ghee. Once hot, place heaped tablespoons of mixture into the pan (I can fit 4 at a time) and cook for approximately 3 minutes each side. Remove to a plate and keep warm as you repeat with the remaining mixture. Serve with butter, syrup and crispy bacon.